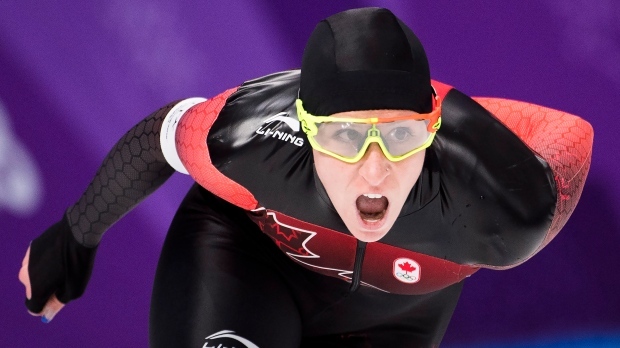 Ivanie Blondin of Ottawa and Laurent Dubreuil of Levis, Que., each took home the national title in their respective 1,000-metre disciplines at the 2018 Canadian single distance speedskating championships on Monday. Blondin, a two-time Olympian, won the women's 1,000 with a time of one minute 15.98 seconds in her first race of the competition, surpassing the World Cup qualifying standard of 1:16.18. Blondin is already pre-qualified for the World Cup in the women's 3,000 based on her results from last season. Dubreuil, a member of the 2018 Olympic team, won the men's 1,000 in 1:08.48, edging out Antoine Gelinas-Beaulieu of Sherbrooke, Que. (1:08.69). Both Dubreuil and Gelinas-Beaulieu posted times fast enough to meet the World Cup qualifying standard of 1:09.11. It was the second win of the competition for Dubreuil, who captured the men's 500 title earlier in the week in 34.64, which also met the World Cup qualifying standard.